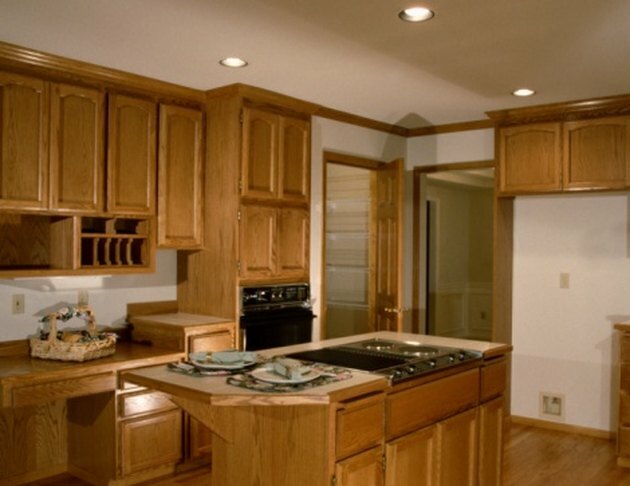 Wood stain covers many kitchen cabinets. Over time and with use, the stain becomes dull. Refreshing the stain brightens the entire kitchen and makes the cabinets look like new. Kitchen cabinets need not be taken apart to refresh a stain, and you can complete the job in just three to four hours, depending on the number of cabinets in your kitchen. Refresh kitchen cabinets in just three to four hours. Fill a gallon bucket two-thirds of the way with warm water. Add two or three squirts of dish soap. Mix. Clean all exposed surfaces of the cabinets using a sponge and the warm soapy water. Rinse the sponge with warm water and wipe the cabinets. Let the cabinets dry for 30 minutes. Lay plastic drop cloth on the counters and floor where you are working to protect them from any drips. Dip a soft clean cloth into a stain that matches the current stain on the cabinets. Wipe excess stain from the cloth using the rim of the can. Wipe the cabinet surfaces in the direction of the grain with the cloth. Start at one end of the cabinets and work your way around the room. Ensure that you open doors and drawers to stain surfaces that are covered when closed. Remember that you are simply refreshing the stain, so do not use too much. One application of stain to the cloth should cover the surface of one cabinet. Let the stain dry according to directions on the can.